When you live on a farm there is always work to be done. When you happen to be a little Border Collie puppy, that likely means you’ll soon be herding farm animals. The extremely intelligent breed is world renowned for their hard work ethic and natural herding abilities, and once you see this little one in action, you’ll understand why! 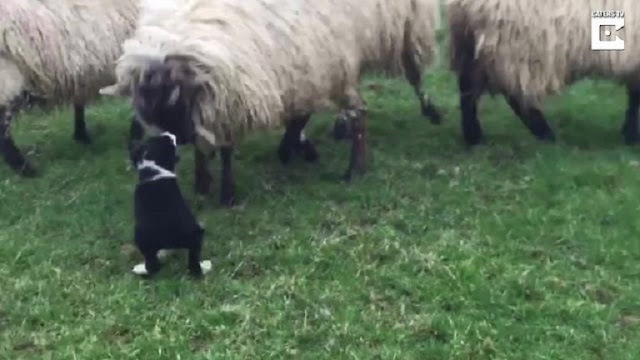 The adorable black and white puppy’s name is Ciara and the video captured here is of her first time ever herding sheep. The seven week old youngster was brought outside to a grassy green field where four full grown adult sheep were grazing. Her owner, Daire Bryne, wanted to make sure that Ciara had what it takes to keep a rowdy flock of sheep in order and let’s just say that she takes to it like a duck takes to water! As soon as Ciara laid eyes on the sheep her instincts kicked right in and she was off chasing after them. It might have been her first time but it looks like she’s been doing this her whole life. The way that she enthusiastically runs around, steering the sheep and keeping them tightly packed together, shows just how much of a natural she is at it. Not only that, she’s also quite courageous. Compared to these full grown sheep Ciara’s really just a tiny baby. The fact that she runs right up to them proves how brave and confident she is. At one point one of the sheep, a large ram who is likely about 20x her size, decides to try and stand his ground. He lowers his head down at her and for a moment it looks like he might charge, but instead he turns around and runs off with the others. If you love puppies and like to smile then be sure to check out this adorable fifth generation Border Collie puppy in action because she’s just too cute!